Welcome to the Digital Edition of the June 2015 issue. • Newsmaker – After the financial crisis, Oscar Suris, Wells Fargo's corporate comms leader, is sharpening the bank's reputation to win back consumers' trust in the financial sector. • World's Apart – PRWeek’s editors span the globe talking to the brands and agencies with boots on the ground in hot markets that will entice, excite, and exasperate comms pros including Ireland, the fastest growing economy in the EU and a burgeoning technology landscape, and Cuba, both a virtual mystery and potential new market for brands. • Telling a powerful story – The US' growing energy independence is just one major story that ensures a huge and captive audience for any messages the sector shares. The keys to effective storytelling in such a complex industry were among many topics tackled by leaders from Chevron, BP, GE Oil & Gas, and the American Petroleum Institute. 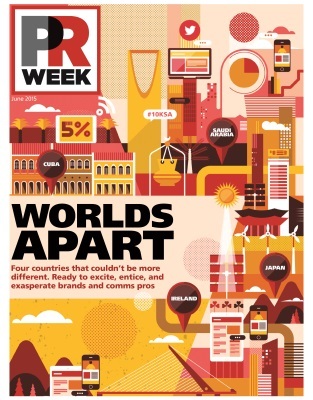 • A User’s Guide to Cannes – PRWeek finds out what is on the minds of PR industry leaders as they get ready to head to Cannes. Agency and in-house communicators are looking for inspiration and networking opportunities and PRWeek will ask veteran attendees to share their insights on getting the most out of this important event. • Market Spotlights – Pelayo Bezanilla, public affairs and comms manager, Coca-Cola, says PR professionals are hot to improve the reputation of Chile's private sector. Shannon Baker, partner and EVP of PR and social media at Gatesman+Dave, discusses how Pittsburgh shook off its reputation as a steel mill city. • CEO Q&A – American Airlines's Doug Parker tells why the company's PR unit has been a key part of its merger with US Airways. • CMO Q&A – Shazam's Patricia Parra talks about brand partnerships and how educating users about new capabilities on the app is a key challenge. Download the Digital Edition now.